This is a closer view of one of the guitar players who sang by our table while dining at Coconut restaurant. I detest taking photos with a flash. I like the warmer tones of natural light. That means, of course, that I sacrifice the clarity of a faster shutter, but at times that helps capture the mood of the movement of a scene, such as today's photo. A comment about Easter Week. Easter is much more of a holiday in Costa Rica than in the USA. Many government offices are closed all week. The Bank of Costa Rica had a short day Wednesday, and is closed for the rest of the week. It is a popular time for beach vacations by Costa Ricans. Today is Sunday, so we have new photos posted on our Viva la Voyage travel photo site. In recognition of Easter, we are showing photos of the Church of the Holy Sepulchre in Jerusalem, considered to be the location of the crucifixion of Christ. One tradition of dinner in Tamarindo's restaurants is that wandering troubadours will usually come by and play requests from diners, of course for tips. These musicians came by during our dinner at Coconut, but they will stroll from restaurant to restaurant. Our region of Costa Rica, the northwest province of Guanacaste, has a tradition of cowboy singers. They originally came in from the fields in the evening and sang songs, although today I think the music is their primary occupation. I sometimes see them at lunch time as well, so they are not out in the fields during the day. This week we have photos of Jerusalem posted on our Viva la Voyage travel photo site. This is a photo of the bananas flambe dessert at Coconut Restaurant, while it is flaming. The blue streak at the top of the photo is the alcohol that is on fire as it is being poured on the banana and ice cream, with a cherry on top. News: President Obama Will Visit Costa Rica. I heard on the news in the USA this week that the President will make a state visit to Mexico in May. In Costa Rica, the big news is that President Obama will also visit Costa Rica. He will meet with President Laura Chinchilla and other leaders from Central American countries. The U.S. Embassy has evidently set up a Facebook page to announce more news about what he will be do while in the country. The last U.S. President to visit Costa Rica was Bill Clinton. The most memorable visit was one by President Kennedy, and his visit was marked by the eruption of a volcano. Here is the main course that I had a Coconut. Coconut features fresh fish and lobster. I sometimes have a difficult time deciding between shell fish or white fish, so I opted for both: fresh local fish topped with a tasty sauce laden with shrimp, accompanied by vegetables and rice. Tomorrow I will show you the desert that I always choose at Coconut. Here is a view of the interior of the Coconut Restaurant. Coconut is owned by an elegant woman named Katarina who is originally from Norway, but she worked in the fashion industry in New York, London and other places before settling down in the restaurant business in Tamarindo. Like Kelly, who migrated from Toronto to open a surf shop in Tamarindo, as I mentioned a few days ago, it is curious how people end up across the world from their original home to live and work. Tomorrow I will show you some of the excellent food served at Coconut. El Coconut is a white table cloth restaurant, which is appropriate, as I would classify its cuisine as fine dining. As you can see from this photo that shows the front sign by the street, like all restaurants in Tamarindo, Coconut is open air. There is no front wall and air circulates through the sides and ceiling. The open air restaurants and hotel lobbies is similar to many hotels and restaurants in Hawaii. The weather never gets cold, so heating systems are not needed, and the open air circulation is enough to avoid the expense of air conditioning. Coconut is right on the beach front road as you enter Tamarindo, so it also catches the ocean breezes. I mentioned yesterday that Kelly's Surf Shop uses as its "address" that it is located next to Coconut Restaurant. Coconut is an excellent restaurant, as I will show in the next few days. As I mentioned in the past, my wife is a "foodie" and we decided to buy a condo in Tamarindo because of the many excellent restaurants. This is a closer view of some of the shiny surfboards in Kelly's Surf Shop. I guess surfboards are like cars, and people like to have attractive colors and patterns to show off their surfboards. Here is a link to the website for Kelly's Surf Shop. I have mentioned before that we do not have street addresses in Tamarindo. People give directions by saying where something is near. Kelly identifies the location of his shop as being "next door to Coconut Restaurant." I guess he figures that everyone knows where Coconut Restuarant is. I think he is right. Tomorrow and the next few days I will show you why. Today is Sunday so we have new photos posted on our Viva la Voyage travel photo site. Julie and I took a trip to the Holy Land earlier this month, so this week we have posted photos of Jerusalem, featuring the Dome of the Rock, which is sacred for Muslims, and the Wailing Wall, the most sacred place for Jews. This is another photo from Kelly's Surf Shop. It must be a challenge to move to Tamarindo, acquire a place for a business, acquire the funds to build up an inventory, and do business in the midst of the competition of about 20 other surf shops. I like Kelly. I don't surf, but I have bought some t-shirts and water shirts from him. The water shirts prevent sunburn while swimming or snorkeling. Kelly arranges surfing tours for guests, and he sometimes places those guests in my condo. Here is a link to the website for Kelly's Surf Shop. The banner says "Live the Dream." I guess that is what he is doing. We have photos of street scenes and people of Grenada, Nicaragua posted this week on our Viva la Voyage travel photo site. Here is the location of the Calgary Flames hockey banner that I showed in yesterday's photo. It is inside Kelly's Surf Shop in Tamarindo. Kelly is from Toronto. I don't know how a Canadian ends up owning a surf shop in Costa Rica, but we do have a lot of Canadian visitors and residents. Here is a banner for the Calgary Flames hockey team. Tomorrow I will place this into context regarding why there would be a hockey banner amidst the surf culture of Tamarindo. We have photos of street scene and people of Grenada, Nicaragua posted this week on our Viva la Voyage travel photo site. The woman recovered and resumed her short walk to the beach. Fortunately, it is a short walk, as the ocean is visible at the end of this path. None of her friends stopped to help her, so this woman regrouped and picked up her surfboard to start again. That is better than Julie during our portage, who left the canoe for others to carry while she went back to gather something else to carry. And, no, she did not pick up one of the heavy Duluth Packs holding camping gear, and which were big enough to hold a family-sized ice chest to carry on one's back. The woman lost control of her surfboard as it was listing to the left, and she dropped it on the trail. I suspect that her thoughts at this point included, "Gee, this is heavier than it looks" and "Oh, well. It is a rental." On the canoe portage story that I have been telling, I carried a canoe and a pack and then walked back to the starting point to carry another load. Halfway back along the trail I found the canoe that Julie was carrying leaning against a fallen tree trunck that crossed the trail at about waist height. But Julie was no where to be seen. More, tomorrow. The form of one of the women carrying a surfboard has started to list to the left side. What will be the consequences of this? I will show you tomorrow. This reminds me of the time that Julie was asked to carry one of the canoes as we portaged between lakes in the Boundary Waters Wilderness area. My brother's daughter was 11 and his son was 8 at the time, so surely the adults would carry the canoes. Today is Sunday, so we have new photos posted on our Viva la Voyage travel photo site. This week we are showing some photos of street scenes and people in Grenada, Nicaragua. So far, so good, as this group of young women walk down a little path that connects the beachfront road with the beach in the southern end of Tamarindo bay. This reminds me of a time that I had the bad judgment to suggest that my wife join my brother and his family and me on a Boundary Waters Wilderness Area canoe trip. After paddling several miles down the first lake, we had to carry the canoes, paddles, fishing gear, and all of the camping gear and food about a mile to reach the next lake. More on that challenge in the days ahead. We have photos of the wildlife of Africa posted this week on our Viva la Voyage travel photo site. I have never seen anyone walking in Tamarindo carrying a brief case. On the other hand, one sees people carrying surfboards everyday. I would never have taken this photo if I did not do a Daily Photo website. I decided to follow these tourists for a few moments to see if they would provide any material for posting. During the next few days I will let you decide if they did. It will also give me an opportunity to tell a little story about my wife, Julie, while she was portaging during a canoe trip in the Boundary Waters Wilderness on the border between Minnesota and Canada. During the last few days I have shown photos of a bookstore. If visitors do not have the time or inclination to read a book, but want a different type of reading, here is a nearby sign advertising "Mayan Astrology Readings." The Mayans did not extend as far south as Costa Rica. The Mayans were expert at astronomy. I recall that there is an observatory at Chichen Itza, and the Mayan Temples are aligned with the sun and feature design elements based on astronomy. I have never had an astrology reading, Mayan or otherwise. I am clueless about what might make an astrology reading a Mayan astrology reading. I will leave that to the consumer. We have photos of the wildlife of Africa posted this week on our Viva la Voyage travel photo site. This week we are showing photos of the wildlife of Africa. This is a photo of one of the paintings that was displayed on the walls of the Jaime Peligro bookstore. It is often said that painters paint and authors write about subjects that are familiar to them and that is certainly the case with respect to the art of Susan Adams. 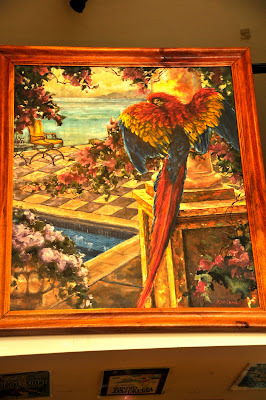 She chooses as the subjects for her paintings tropical birds and other scenes that one can find in Costa Rica. Here is a link to the website for Susan Adams and her art. 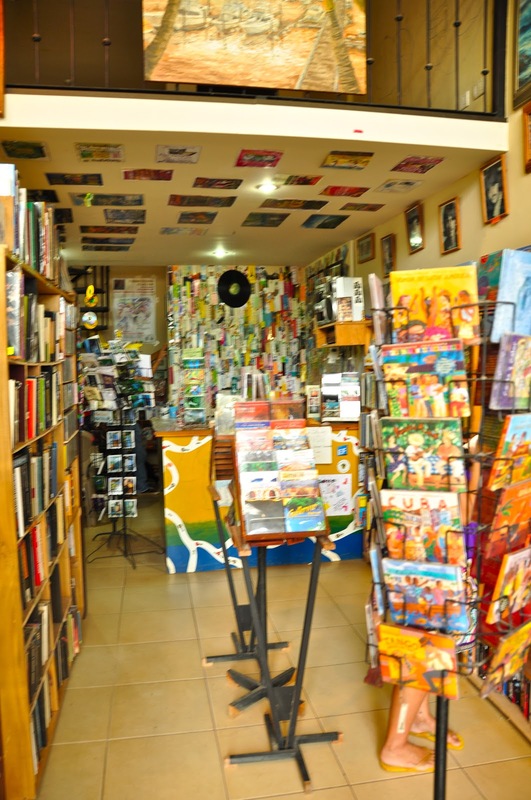 The Jaime Peligro Bookstore displays some of the artwork of Susan Adams, a local artist who used to have a gallery in Tamarindo. She no longer has her own gallery, but her art is displayed at the bookstore, so I presume that people who see her work there can buy it or contact her to commission her to do paintings. I have done a post about Susan Adams' art in the past. She likes to do tropical themes, which makes sense for an artist who lives in Tamarindo. Here is a link to the website for Susan Adams and her art. We have photos of the wildlife of Africa posted on a posted on our Viva la Voyage travel photo site. 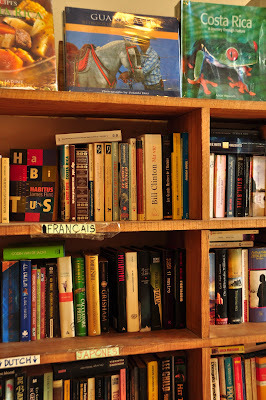 My other posts of the inside of the Jaime Peligro bookstore have focused on the books on the shelves, so here is a little wider view of the shop. Here is a link to an earlier post I did about the bookstore in November 2008 for a City Daily Photo theme day of "Bookstores." Here is a link to the website of the Jaime Peligro Bookstore. I was amused by the bookstore labels for books identified as "trashy romance novels" and "more trashy romance novels." People apparently like to read romance novels at the beach. 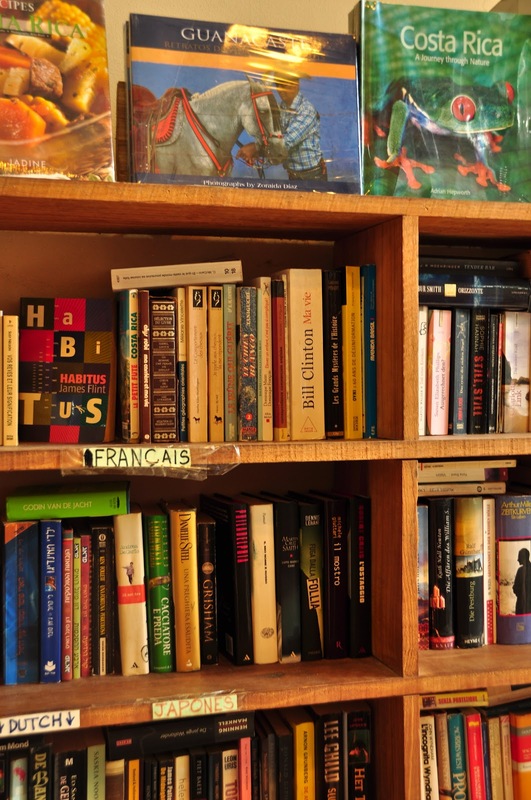 Guests who stay in our condos leave books that they have finished on our bookshelves, and many of them are romance novels. We have our own mini library in the condos. This week we have a posted photos of the wildlife of Africa on our Viva la Voyage travel photo site. Just to show that yesterday's photo of books in German was not a fluke, here is another photo, which shows books available in French, Dutch and Japanese. Not surprisingly from a marketing standpoint, the display of books about Costa Rica get a more prominent display on the shelf than the foreign language books below. I suspect that the inventory of foreign language books does not move very fast. I will comment about beach reading tomorrow. This week we have photos of waterfowl along the shores of Lake Nicaragua posted on on our Viva la Voyage travel photo site. In a bookstore in Costa Rica you would expect to find books about Costa Rica, of course. But would you expect to find German language books for sale? I don't think so. 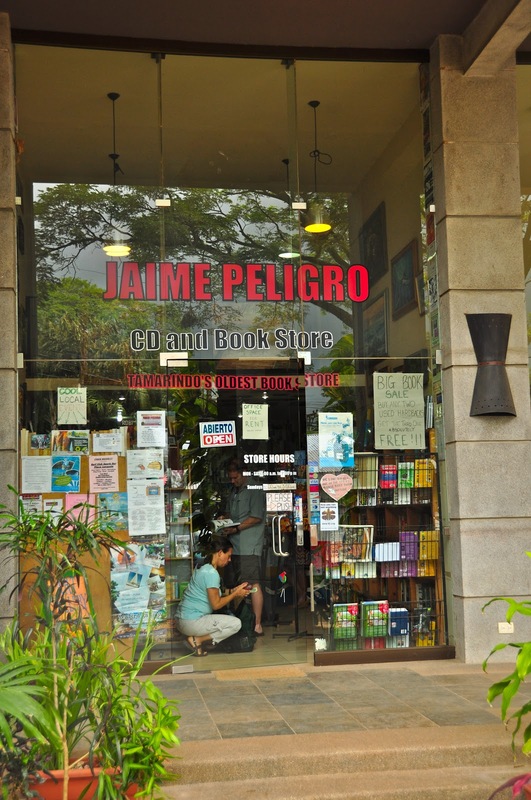 Most of the books in Jaime Peligro Bookstore in Tamarindo are in English, as most people in Tamarindo are from the USA and Canada or speak English because most visitors are from the USA and Canada. There is a growing number of European tourists in Tamarindo. This bookstore sells new and used books, so some of the foreign visitors have recycled their books here, including visitors from Europe. This photo shows the German book selection, with Germany identified in signs in German and Spanish. 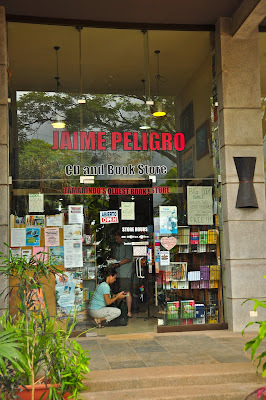 One of the best things about Jaime Peligro Bookstore is being assisted by Jim Parisi, or just talking to Jim. He is a wealth of information and he is very willing to share it. He is also an expert on music and writes reviews and articles on the local music scene for local publications. I mentioned Jim in an earlier post I did about the bookstore in November 2008 for a City Daily Photo theme day of "Bookstores." I will show some more of the bookstores in the days ahead. 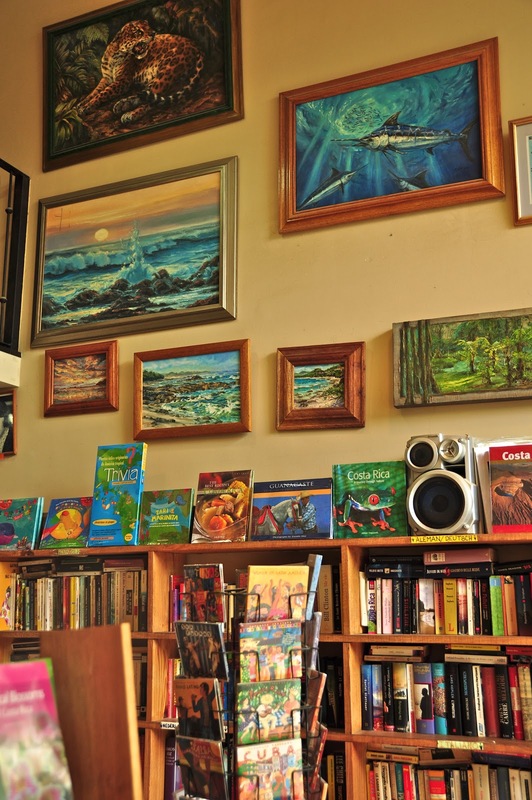 Even though Tamarindo is a small beach resort, the town does have good local bookstore. 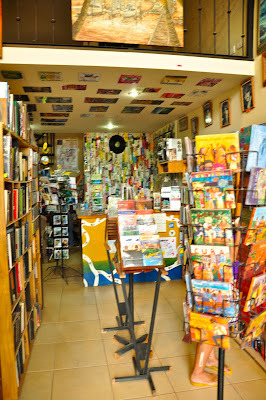 This is the Jaime Peligro Bookstore in the middle of town. There is a farmer's market in the parking lot in front of this bookstore on Saturdays. I will show you some more photos during the next few days to that you can join me on a little virtual visit to this unique bookstore. Tourism is a huge industry in Costa Rica, and Tamarindo is a resort town that is nearly 100% dependent on tourism. There are lots of vans carrying tourists on excursions picking up guests in town. I saw this slogan on one of them. I am not sure this is a good slogan for tour operator to use for its tourist vans. After all, one of the main reasons to hire a van and driver for an excursion is to avoid getting lost. On the back roads of rural Costa Rica, there are few directional signs, and getting lost is a real possibility. A closer view of yesterday's photo shows some workers at the cupola on top of one of the buildings at the Tamarindo Diria Resort. It looks like they are fixing a light that shines on the dome at night. I get nervous when I see workers on a roof, although it looks like they are on a flat part of the roof. The roof tiles that you see are generally not strong enough to hold a man's weight without breaking. Mu wife is a leading authority on worker safety and fall protection. The U.S. Occupational Safety and Health Administration (OSHA) has had her speak at national conferences on Protecting Spanish Speaking Workers because many of the construction workers in the US come from Latin America. Julie works with many companies to help them comply with OSHA standards and to defend them when needed. In the US, OSHA regulations would require measures such as lanyards and harnesses to tie off workers up on a roof, with regulations regarding the strength of the lanyards, etc. By the way, in Costa Rica the construction and agricultural workforce is composed heavily of people from Nicaragua, which has a per capita income about one-third of Costa Rida. And speaking of Nicaragua, this week we have photos of waterfowl along the shores of Lake Nicaragua posted on on our Viva la Voyage travel photo site. While on the main street of Tamarindo, which is the beachfront road, taking the photos that I have posted during the last few days, something caught my eye about this scene at one of the buildings of the Tamarindo Diria Resort. What it was, a closer view, and a bit of opinionated commentary by me, not surprisingly to regular readers, will be shown tomorrow. 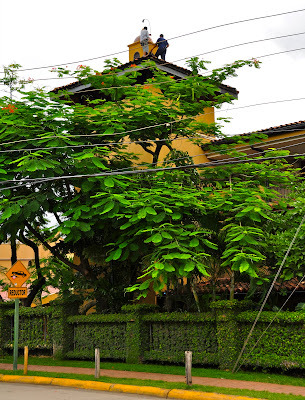 Today's photo illustrates that underground utilities have not arrived in rural and small town Costa Rica. That is not surprising, as underground utilities are rare throughout the world. Costa Rica has a lot more infrastructure needs, such as improving rural road conditions, before putting money into burying utility lines. Overhead power lines never bothered me very much, until I became serious about photography. I do not use photoshop and do not have the time to edit photos to try to take out unsightly power lines. Today is Sunday, so we have new photos posted on on our Viva la Voyage travel photo site. This week we are returning to show a few more photos of Nicaragua, featuring the waterfowl in the maze of islands along the shores of Lake Nicaragua. Naturally, they look a lot like what you would see in Costa Rica. I mentioned yesterday that we don't have any Starbucks in Tamarindo. We also do not have any McDonald's, Burger King, KFC, or any other U.S. hamburger/fast food places. We do have a Subway, however, and a TCBY. This Subway shop is only about 1/2 block from our Diria condo, and it is a convenient place to go out and grab a sandwich for lunch and bring it back to the condo if we are working through lunch and do not have time to enjoy one of the many restaurants. This week we are showing photos of Nicaragua on our Viva la Voyage travel photo site, featuring the doorways of the Spanish Colonial city of Grenada. Today's worldwide Daily Photo theme is "cafe chairs." This is the coffee shop at the Tamarindo Diria Resort, where we have one of our two condos. It is a great place for morning coffee and pastry, and later in the day they have brink oven pizza here. 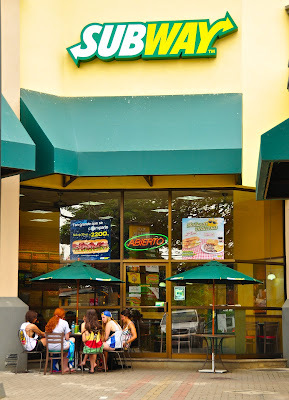 There are no Starbucks in Tamarindo, although Starbucks has come to San Jose, Costa Rica. Costa Rica is, of course, a major coffee producer, and its blends are premium in the world of coffee aficionados. Whenever we visit Costa Rica, we bring back coffee for family and friends. Julie's mother and her secretary say that the coffee we bring back is the best they have ever had. Bags of gourmet coffee are sold at the local food markets and tourist shops.